Where is the Super 8 Park Stay & Fly service located? The Super 8 Park Stay & Fly service offers extended parking near PDX at 11011 Northeast Holman in Portland, Oregon 97220. This is the location of Affordable & Budget the Super 8 Portland Airport hotel. It's just moments from Portland International Airport and also nearby Port of Portland. Can I use Super 8 Park Stay & Fly even if I don't stay at your hotel? Yes, while we offer affordable Park Stay and Fly packages that Portland, Oregon travelers can depend on, we also offer rang of Only Parking options at low flat rates that are better than many other private airport parking facilities. We provide three-day, seven-day, 10-day and even 30-day PDX Park Stay and Fly special offers and can customize our service to your needs and desires. We understand that Secure PDX Portland Airport parking on airport property is very expensive, and we work to provide you an affordable alternative with 24/7 Hour Access. If you choose to stay at Super 8 Portland Airport the night before your flight, your Portland International Airport Park Stay and Fly package is complete free, plus we offer a shuttle to the airport. 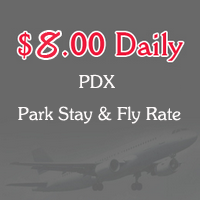 You will find no better deal for PDX airport Stay Park Stay & Fly, especially if you will be gone for several days. What are the shuttle hours? When you turn to us for Park Stay and Fly packages Portland, Oregon travelers can depend on, our airport shuttle is available from 4 a.m. to 2 a.m. every day. Of course, pickup and drop off is free. Our Spacious & well organized secure parking lot is available thought the day. You can park or take away your car’s anytime, we allow 24/7 Hour Access. What else do I need to know about your PDX Airport Park Stay and Fly Hotel? Super 8 Portland Airport is available for your overnight accommodations whether you choose to park with us while gone or not. We provide excellent amenities, comfortable rooms and a great overall experience. Contact us now to learn more.